Among the many emotions I felt when my DrinkQT care package arrived was confusion. 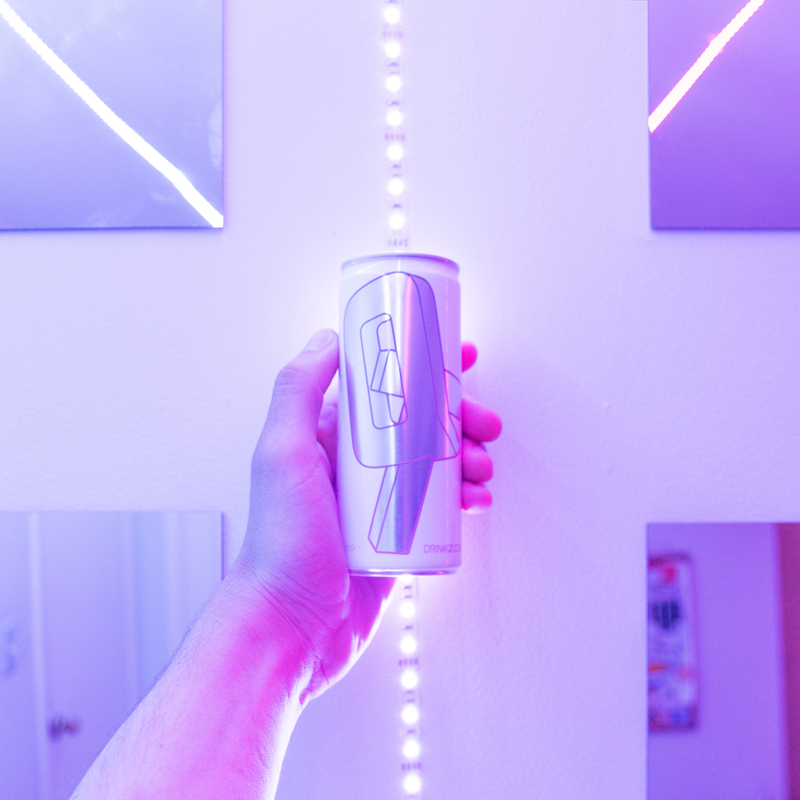 To me, the concept energy drink had only existed as a digital fantasy: impossibly hyped, and presented with complete control over the product’s aesthetics. But like any other physical object, the can in front of me had small scratches and dings from shipping, and my excitement about the product being real was quickly shadowed by my disappointment over the constraints a real product must abide by. 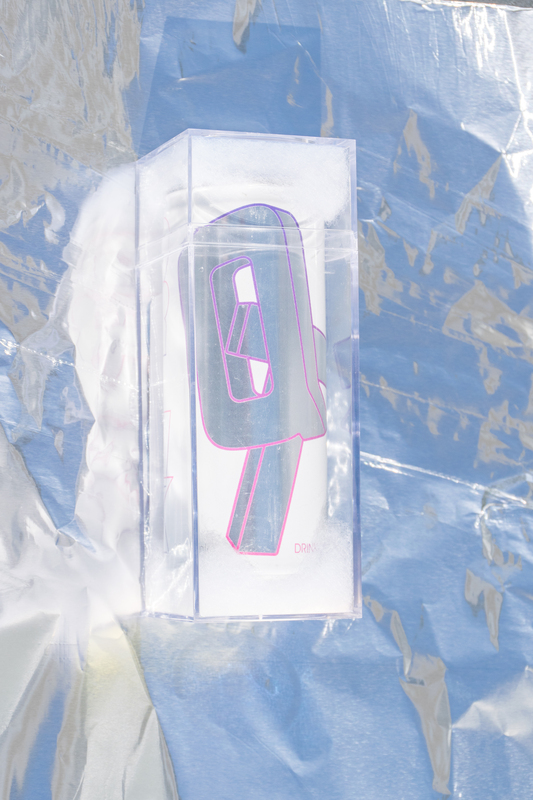 These constraints often appear to be an issue for PC Music – QT’s label – as they attempt to adapt their aesthetic visions to more traditional merchandise. In effect, their strategy runs counter to the mainstream model; their groomed digital existence struggles to be retrofitted into old media, just as traditional brands have struggled to build a digital image. For those who have not yet heard of PC Music, it is a concept label that consists of a group of friends with extreme personalities creating pop songs that sound like they were digested by a computer running Windows 95. About a year ago, every major music blog was applauding PC Music’s releases as clever, thought-provoking parody of pop culture. But now, with label head A.G. Cook assert ing in a recent interview with Rolling Stone that his label has never been a parody, QT actually creating a real product after the New York Times proclaimed it “fictitious”, and GFOTY facing major backlash for her racially-charged remarks which, despite falling in line with her vapid persona, were inexcusable even if her art were a parody, it’s now hard to know what to think. In the past few months, as their label began to reach commercial success, it seems PC Music’s artists ar unintentionally trolling the entire music journalism scene. Even with the incredible amount of media coverage surrounding “Hey QT” – QT’s only song, a self-referential single that served as a promo for her drink – we know very little about QT the artist. Her Instagram feed is filled with cryptic captions and images that become more abstract the further back you scroll. QT’s obsession with synthetic textures and materials shines through in her social media presence, as well as her desire for airbrushed perfection manifests in her art. Whether it’s through the effervescent synths that punctuate QT’s vocals on “Hey QT”, her big eyes and perfectly straight golden red hair, or the polished can design itself, every visible aspect of QT contributes to an extremely strong sense of brand. Just like other contemporary pop-stars, QT’s brand is what makes her music so appealing, yet she is unique in that she doesn’t try to hide her shameless self-promotion. Rather than having a brand built around her music by record industry executives and marketers, she has built her music around her brand. The art itself is the brand. As performance art, QT’s brand is very effective; she is able to leverage social media to reveal her image in a polished format. Being able to bring her brand into real life poses much trickier challenges. cent caps, which are a nice dash of the QT aesthetic, but the cube scratched up the outside of the can in transit. I was surprised to feel so disappointed about a couple of dings on an energy drink can. Just about any product comes with small imperfections, yet they are exactly what makes it impossible for QT to bring her digital fantasy into full-fledged reality. Despite these flaws in the design, the can fits QT’s intended aesthetic well. But with its price closer to a band t-shirt than a Red Bull, how many people would dare to crack open the can and actually drink QT? After chilling my can, I sampled a few sips of DrinkQT. Unlike in the music video, the drink in front of me had a subtle yellow hue – not purple – much like Red Bull, but paler. With PC music working closely with Red Bull Music Academy on their Pop Cube event this year, I was expecting the label to produce a beverage that tasted similar, if not identical to the namesake beverage of their sponsors. DrinkQT’s flavor is actually quite unlike Red Bull, and not in a bad way either. The energy elixir is significantly more tart, eschewing Red Bull’s saccharine overtones for a much more nuanced flavor. It features notes of green apple and bubblegum. The flavor of DrinkQT complements QT’s song so well I truly did feel like the I was listening to “Hey QT” through another medium while sipping the beverage. It is refreshingly tangy and sweet, but without any substance whatsoever. Part of the drink’s image is its marketing. QT sells the beverage with the language you’d expect to see on a corporate retreat. DrinkQT promises to “contribute to upward shine, vertical connectivity, and personal growth.” While it does none of these things, this marketing well-serves her satire; it illuminates the failure to turn digital promise into reality. However, its satire prevents it from succeeding as a standalone product, as only fans who are in on the story would pay for it. It’s brilliance as merch lies in its ability to match the other mediums in which QT distributes her art. If it were released with similar pricing and availability to its competitors, I think it would have a serious shot at gaining traction in the energy drink market, but is that its intention? For now it remains a novelty for those who have no qualms about paying $20 for an limited-edition energy drink. Considering QT’s brand is her art, DrinkQT transcends merch. We always knew DrinkQT would exist, the ultimate result of QT’s perfect brand. But what’s next for QT and her art? Does the production of DrinkQT complete QT’s artistic vision? Let’s hope not.